Utah’s offense showed signs of progress in a loss at Washington State, but regressed in the second half. (AP Photo/Young Kwak) Washington State cornerback Sean Harper Jr., right, tackles Utah running back Zack Moss during the first half of an NCAA college football game in Pullman, Wash., Saturday, Sept. 29, 2018. Pullman, Wash. • In the basement weight room where former Utah football stars Trevor Reilly and Jake Murphy once apologized to fans and alumni for missing a bowl game in their final seasons, members of the current team could promise only to overcome the program’s latest loss to Washington State. This season cannot be described as totally crumbling, until the Utes lose to a Pac-12 South rival. Yet it certainly is getting away from them, with a potentially meaningful victory eluding Utah in a 28-24 defeat Saturday. The weight room in WSU’s old gym adjacent to Martin Stadium serves as a postgame interview area, and Ute coach Kyle Whittingham suggested as he exited that media members should “get some reps.” He’ll go back to work this week after a weird game in Pullman, where Utah’s offense improved and then regressed. The defense played poorly for 1½ quarters and recovered remarkably well, only to give up an 89-yard touchdown pass. The teams combined for 42 points in the game’s first 24 minutes and 10 points in the last 36 minutes. So now what happens? ESPN’s Football Power Index projects 6.7 wins for Utah (2-2), good enough for bowl eligibility. The Utes remain contenders for the South title — once they stop facing the North, anyway. Saturday’s game at No. 14 Stanford is their third straight crossover game to begin the conference schedule. An 0-3 start would be tough to overcome, although not impossible in the landscape of the South. The bigger picture of the program is more discouraging. The Utes have lost eight of their past 10 conference games. Going back to October 2016, when they were ranked No. 17 and targeting a Rose Bowl bid, they’re 4-11 in Pac-12 play. That’s not a good trend for Whittingham, now in his 14th season. Beating the Cougars would have altered Utah's outlook, especially if the offense had extended its early success. The Utes totaled 59 yards on their last five possessions, when they “couldn't get out of our own way,” Whittingham said, due to penalties. • Defensive coordinator Morgan Scalley made a good adjustment, going with a standard a four-man defensive line (aided by Leki Fotu’s availability following a targeting suspension) in the second half after unsuccessfully using a blitzer as the fourth rusher. A second-half shutout would have been a phenomenal achievement for Utah’s defense, but it didn’t happen. 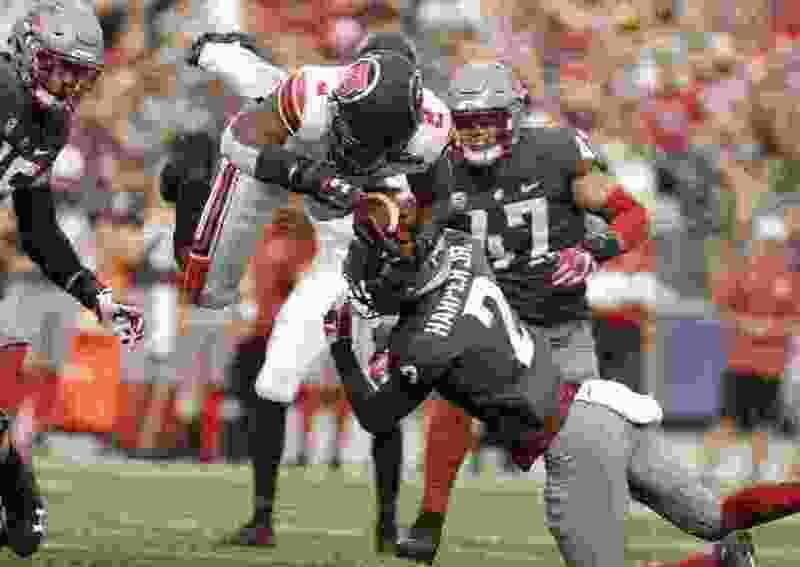 • Utah’s defensive backs need a big comeback, starting against Stanford’s capable passing game, to fulfill their goal of becoming known as the best secondary in school history. Cornerback Julian Blackmon had a rough game, even before being beaten for the winning touchdown. Gardner Minshew, Washington State quarterback. The Cougar offense endured as much of a lull as Utah’s, but Minshew kept throwing and finished with 445 yards and three touchdowns, besides running for a score. Runner-up: Utah punter Mitch Wishnowsky, who made WSU start three fourth-quarter drives from inside the 10. Minshew’s 89-yard TD pass to Easop Winston, in one-on-one coverage by Blackmon. If that play had failed, WSU would have faced third and 6 from its 11. Runner-up: Take your pick of Covey’s punt return or his fourth-down conversion, both canceled by penalties. Stanford dropped out of the top 10 after a 38-17 loss at Notre Dame, as the Cardinal defense was shredded for 550 total yards. Whether the Ute offense can exploit Stanford to anywhere near that degree is another question. So is Utah’s reliance on its secondary to deal with quarterback K.J. Costello and receiver JJ Arcega-Whiteside in single coverage, while focusing on stopping running back Bryce Love. The 2017 Heisman Trophy runner-up left Saturday’s game in the third quarter, due to an apparent leg injury.